Two statements regarding anarcho-feminism from 1971 by Chicago anarcho-feminists and the Black Rose Anarcho-Feminists respectively. We believe that a Woman’s Revolutionary Movement must not mimic, but destroy, all vestiges of the male-dominated power structure, the State itself – with its whole ancient and dismal apparatus of jails, armies, and armed robbery (taxation); with all its murder; with all of its grotesque and repressive legislation and military attempts, internal and external, to interfere with people’s private lives and freely-chosen co-operative ventures. While we recognise important differences in the rival systems, our analysis of the evils of the State must extend to both its communist and capitalist versions. We are all socialists. We refuse to give up this pre-Marxist term which has been used as a synonym by many anarchist thinkers. Another synonym for anarchism is libertarian socialism, as opposed to Statist and authoritarian varieties. Anarchism (from the Greek anarchos – without ruler) is the affirmation of human freedom and dignity expressed in a negative, cautionary term signifying that no person should rule or dominate another person by force or threat of force. Anarchism indicates what people should not do to one another. Socialism, on the other hand, means all the groovy things people can do and build together, once they are able to combine efforts and resources on the basis of common interest, rationality and creativity. We love our Marxist sisters and all our sisters everywhere, and have no interest in disassociating ourselves from their constructive struggles. However, we reserve the right to criticise their politics when we feel that they are obsolete or irrelevant or inimical to the welfare of womankind. As Anarcho-Feminists, we aspire to have the courage to question and challenge absolutely everything – including, when it proves necessary, our own assumptions. There have been two principle forms of action in the women’s liberation movement. One has been the small, local, volitionally organised consciousness-raising group, which at best has been a very meaningful mode of dealing with oppression from a personal level and, at worst, never evolved beyond the level of a therapy group. The other principle mode of participation has been large, bureaucratised groups which have focused their activities along specific policy lines, taking great pains to translate women’s oppression into concrete, single-issue programmes. Women in this type of group often have been involved in formal leftist politics for some time, but could not stomach the sexism within other leftist groups. However, after reacting against the above-mentioned attitude of leftist males, many women with formal political orientations could not accept the validity of what they felt were the ‘therapy groups’ of their suburban sisters; yet they themselves still remained within the realm of male-originated Marxist-Leninist, Trotskyist, Maoist rhetoric, and continued to use forms of political organisation employed by the male leftist groups they were reacting against. The elitism and centralisation of the old male left thereby has found, and already poisoned parts of the women’s movement with the attitude that political sophistication must mean ‘building’ a movement around single issue programmes, thereby implying that ‘we must be patient until the masses’ consciousness is raised to our level.’ How condescending to assume that an oppressed person must be told that she is oppressed! How condescending to assume that her consciousness will grow only by plodding along, from single-issue to next single issue. In the past decade or more, women of the left were consistently intimidated out of fighting for our own liberation, avoiding the obvious fact that all women are an oppressed group. We are so numerous and dispersed that we have identified ourselves erroneously as members of particular classes on the basis of the class of ‘our men’, our fathers or our husbands. So women of the left regarding ourselves as middle-class more than oppressed women, have been led to neglect engaging in our own struggle as our primary struggle. Instead, we have dedicated ourselves to fight on behalf of other oppressed peoples, thus alienating ourselves from our own plight. 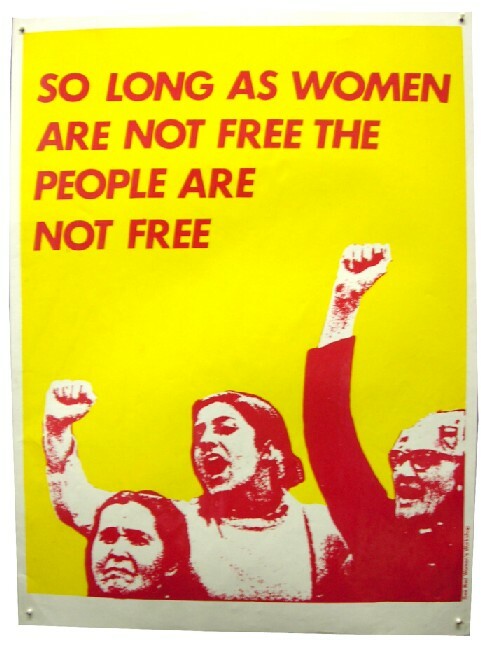 Many say that this attitude no longer exists in the women’s movement, that it originated only from the guilt trip of the white middle class male, but even today women in autonomous women’s movements speak of the need to organise working class women, without concentrating on the need to organise ourselves – as if we were already beyond that level. This does not mean (if we insist first and foremost on freeing ourselves) that we love our oppressed sisters any the less; on the contrary, we feel that the best way for us to be true to all liberation struggles is to accept and deal directly with our own oppression. We do not believe that rejection of Marxist-Leninist analysis and strategy is by definition political naiveté. We do not believe it is politically naive to maintain the attitude that even a ‘democratically centralised’ group could be considered the ‘vanguard’ spokeswoman for us. The nature of groups concerned with ‘building’ movements is: 1) to water down the ‘more extreme’ dreams into ‘realistic’ demands, and 2) to eventually become an organ of tyranny itself. No thanks! There is another entire radical tradition which has run counter to Marxist-Leninist theory and practice through all of modern radical history – from Bakunin to Kropotkin to Sophie Perovskaya to Emma Goldman to Errico Malatesta to Murray Bookchin – and that is Anarchism. It is a tradition less familiar to most radicals because it has consistently been distorted and misrepresented by the more highly organised State organisations and Marxist-Leninist organisations. Anarchism is not synonymous with irresponsibility and chaos. Indeed, it offers meaningful alternatives to the out-dated organisational and policy-making practices of the rest of the left. The basic anarchist form of organisation is a small group, volitionary organised and maintained, which must work toward defining the oppression of its members and what form their struggle for liberation must take. Organising women, in the New Left and Marxist left, is viewed as amassing troops for the Revolution But we affirm that each woman joining in struggle is the Revolution. WE ARE THE REVOLUTION! We must learn to act on impulse, to abandon the restrictions on behaviour that society has taught us to place on ourselves. The ‘movement’ has been, for most of us, a thing removed from ourselves. We must no longer think of ourselves as members of a movement, but as individual revolutionaries, co-operating. Two, three, five or ten such individual revolutionaries who know and trust each other intimately can carry out revolutionary acts and make our own policy. As members of a leaderless affinity group, each member participates on an equal level of power, thus negating the hierarchical function of power. DOWN WITH ALL BOSSES! Then we will not be lost in a movement where leadership determines for us the path the movement will take – we are our own movement, we determine our own movement’s direction. We have refused to allow ourselves to be directed, spoken for, and eventually cooled off. To these ends, and because we do not wish to he out of touch with other women, we have organised as an autonomous collective within the Women’s Centre in Cambridge, Mass. The Women’s Centre functions as a federation; that is, not as a policy-making group, but as a centre for various women’s groups to meet. We will also continue to write statements like this one as we feel moved to. We would really like to hear from all and sundry! The Anarcho-Feminist Manifesto was written by Chicago Anarcho-Feminists. Blood of the Flower was written by Red Rosia and Black Maria of Black Rose Anarcho-Feminists, who in 1971 could be reached c/o The Women’s Centre, 46 Pleasant Street, Cambridge Mass. Both articles first appeared in Siren – A Journal of Anarcho-Feminism Vol 1 No 1 1971 (now defunct), published in Chicago. They were next published together as a pamphlet by the Seattle section of the Social Revolutionary Anarchist Federation and the Revolutionary Anarchist Print Fund, c/o 4736 University Way NE, Seattle, Wn 98105. Posted on December 29, 2012, in Theory of Anarchism and tagged Anarcha-Feminism, Anarchism. Bookmark the permalink. Leave a comment.